Give the Gift of Farm Collector! Farm Collector is the perfect gift for friends and relatives who prize the past. Each issue is dedicated to the preservation of vintage farm equipment and the celebration of the good old days of the American farm. 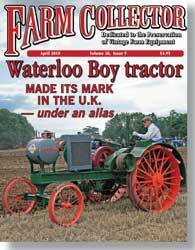 There's no other magazine like Farm Collector! Each gift subscription is for 1 year (12 issues) at $24.95.